« Learn to make comments not spam! Of course it would be much easier if you did it on the beginning before any posts have been written. But you may still fix it and keep all your links indexed by google and up to date. And you won’t have to redirect anything. We will just make it look better for your visitors. You have missed it on the beginning. So you need to do it now. 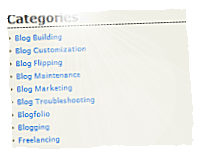 You need to plan your categories such way, so all of them would fit your blog niche. If you have some posts that are off topic, you should think about category called "Misc" (or something similar). Now go to your WordPress admin panel to "Posts / Categories" and create all missing categories. But do not remove any old that do not fit your new plan! You must keep them or you would loose a lot of search engine traffic! We will hide them in next steps. This part is most time consuming. More posts you have more time it would take to you. You should add your posts to new categories and keep old ones. Such way that it would be in old and new category same time. To display only desired categories. You will need to install "Executable PHP widget". It would replace your current "Categories" widget. In the line "'include' => '4,5,6'," you need to include your desired categories IDs. If you don’t know how to find category IDs – I’ll describe it later in this post. In this option you should edit this line "'exclude' => '1,2,3',". And put comma separated category IDs to exclude from the list. Where tho find category ID’s? Your category ID is here "cat_ID=1". So in this case it is "1". It is a small tweak but it let your visitors find out your blog niche. It let them not to be lost in all categories and if they are interested in your blog topic – it is much more possible that they would subscribe your rss or follow you on twitter or even subscribe for updates via email (check my top right sidebar… :). I want to be helpful for my readers so please let me know in the comments if this post was useful for you and if you want me to write more things like this. WordPress categories are very easy to control simply using the admin panel. You don’t need code to do it. WordPress admin let you add and delete categories. You can not hide it on main page (this post says about it). If you just delete your categories you would loose all search engine traffic, backlinks and bookmarks as your permlinks would change. This method let you avoid this problems.